Freelancing covers a wide range of industries and skills, but one thing holds true across all of them: scammers are everywhere looking to take advantage of eager freelancers hoping to earn money from home. Here are 10 common freelance scams you may encounter, and how to avoid becoming a victim to them. If you’re part of the “gig economy”, you’re not alone. According to a 2017 survey from Upwork, over 57 million freelance workers live in the US alone. Those numbers are growing year-over-year. And while freelance work can be incredibly empowering, it can also come at a significant cost if you’re not careful. That’s because many completely green freelancers far too often fall prey to scams intended to lure them into easy earnings, only to have them ripped away. As a freelance writer myself, I’ve seen my fair share of scams targeting freelancers. From job postings that are clearly fraudulent, to someone who actually tried to convince me to share my Upwork account with him, I’ve had to navigate the sometimes risky world of freelancing in order to make a living in the gig economy. Why do freelancers fall for scams? If you’ve never fallen for a scam, you may wonder how and why freelancers are easy prey for con artists and criminals. There are two major reasons why some freelancers fall for scams, both of which are identified in Upwork’s 2017 “Freelancing in America” report: income predictability and finding work. In many freelance industries, such as writing, those with more experience have a much easier time finding work. New freelancers often have to undersell themselves to get work, experience, and portfolio-worthy material. The lack of decent-paying work can lead to significantly lower income or gaps in income. This struggle to claw one’s way out from the bottom can easily lead to understandable desperation. And when presented with opportunities to move up, many freelancers may have their scam radars tuned down or turned off when presented with the prospect of easy, quick, and high-income work opportunities. 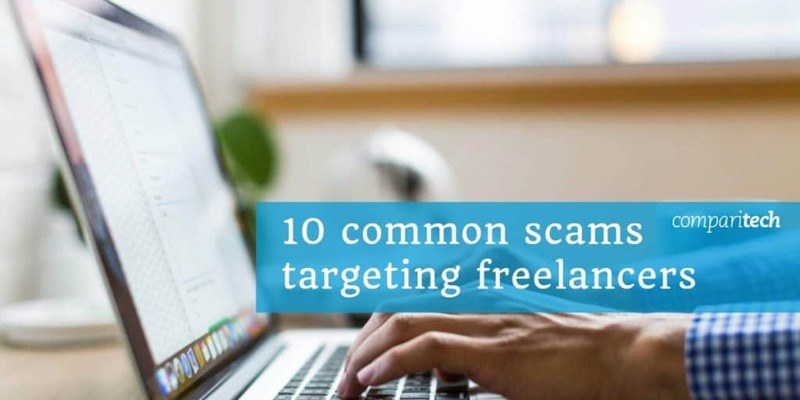 With that in mind, if you’re new to freelancing in any industry and looking to avoid some of the common scams targeting freelancers, here’s a useful list of 10 scams you may encounter on your journey to the top. Although freelance writing, editing, and graphic design are among the most well-known types of freelancing, “work-from-home” schemes have existed for decades and indeed fit within the category of the gig economy. Despite the numerous legitimate ways to earn income from home, including through freelance platforms like Upwork, Freelancer, Toptal, and Guru, some people still fall prey to non-descript work-from-home scams. Many of these scams seem attractive because they generally do not require any specialized skill-sets, as opposed to most official and legitimate freelancing platforms. Many work-from-home scams advertise themselves based on supposed high earnings potential but don’t provide any details regarding what work will be performed until you’ve called their number, or entered into a digital communication exchange with the scam artists. The easiest way to avoid these types of scams is to utilize only legitimate freelance platforms. These sites may have scam artists working within them, but most have reporting and monitoring methods that reduce the number of scam jobs that might be posted. You’ll also want to avoid clicking on any links or web ads similar to the one above. If the “work-from-home” advertisement fails to state what kind of work is being performed, it’s likely a scam, or at the least, overstating the earning potential. If you’re not sure whether a site or service is legitimate, do a quick Google search, such as “[site name] reviews” or “is [site name] a scam”. If a website has bad reviews or multiple sources state it’s a scam, look elsewhere for work opportunities. There are dozens of job boards out there, each with varying levels of content filtering to help remove scams from their systems. Some offer better protections to freelancers than others. For example, if you’re using Craigslist’s “Gigs” section, there’s no real way to tell whether a job is the real deal or a scam in disguise. Because Craigslist has no features in place to rate the individuals posting work, you have no data to go on that will help you determine if the job poster is a legitimate company or someone hoping to scam you out of house and home. For example, this job posting on Craigslist provides no way to tell whether the job poster is trustworthy enough to pay for completed work. There’s also no way to tell whether he or she isn’t just phishing and hoping to steal information from applicants. Your best option is to only seek work through official job posting websites and freelancing platforms. However, fake job postings and scams exist on those platforms and sites as well, so there are a few extra steps you’ll want to take. Only take work from employers who have a verified work history and good ratings. Most freelance platforms now allow freelancers to rate clients following the completion of projects and allow clients to rate their freelancers. This creates a paper trail, so to speak, that makes it easier to determine whether a client is the real deal. However, there may be times when you see an interesting job post from a new client or a potential employer who has no previous history. If that’s the case, be extra cautious before agreeing to do work. If you apply, make sure the client does not do things like ask you to pay money to take work or asks to take communication off of the official freelancing platform. Check the client’s feedback score and reviews. Bad reviews do not necessarily mean the client is a scammer. In fact, most individuals who make scam posts won’t have any previous work history on a platform at all. Bad reviews are often an indication of a client who is difficult to work with. Still, there is a chance the client has a tendency to ask for more work than agreed upon or tries to underpay, delay payments, or not pay at all. That might be indicated in the reviews on the platform. The great thing about most freelancing work is that you often already have the equipment you need to get started. If you’re a freelance writer or artist, for example, you probably have the software you need to start taking work immediately. And if you’re a ride-share worker for Uber or Lyft, owning your own car that passes either service’s inspection standards means you’re ready to roll (literally). However, some freelance scams will ask you to pay some type of fee or purchase the client’s product in order to begin working for them. Such scams often promise you either access to lots of work for an entry fee or promise huge rewards for reselling the company’s product after you purchase it. There’s usually no guarantee for either with these types of scams. More often than not, the company or client making individuals pay up front to work for them are earning a profit by signing people up and/or making them purchase the product they want you to sell. The advice here is simple: if you need to pay to access work with an individual client, don’t work with that client. Note that this is not the same as a service fee for using a platform. For example, sites like Freelancer.com and Upwork offer free sign-ups and a limited number of free proposal submissions, but charge a fee for the opportunity to post more proposals. This wouldn’t be a scam, but a cost of using their service to find work — and it’s also not mandatory. But if you do find a service that requires you to sign up and pay a fee or buy a product before you can do work for them, look elsewhere for work. You’re not likely to earn a return on the “investment”. You sign up to the service/company and become a “brand ambassador” or some other related term. You’re compelled to buy the company’s products ahead of time, usually at a “discount”. You’re then tasked to sell those products for the company, which may or may not take a cut of the profit you earn. You’re also compelled to get friends, families, and acquaintances to sign up as “brand ambassadors” as well, and the company often offers bonuses if you get more people to sign up to help sell the product. Unfortunately, multi-level marketing is perfectly legal in many places, including the U.S., but tenuously so. Large MLM brands, such as Amway and Mary Kay, have been around for decades and have all faced numerous legal challenges (usually for fraud or abusive behaviors). 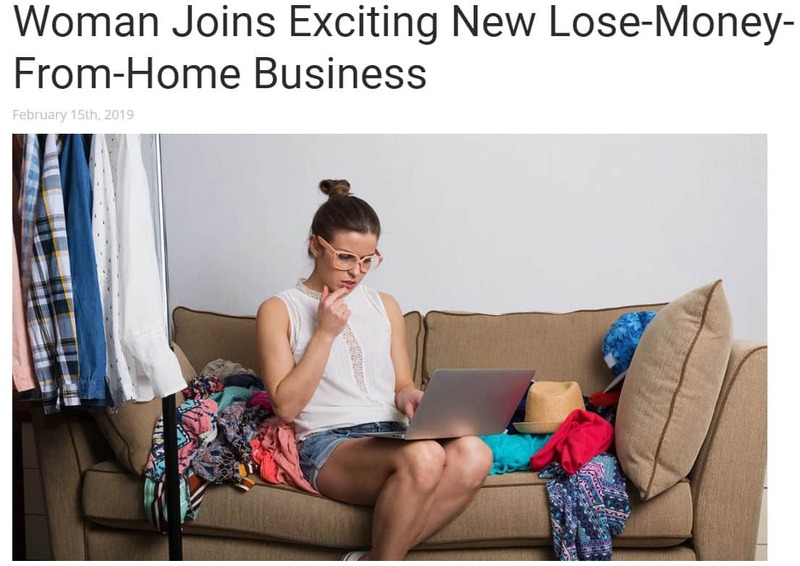 Others, such as LulaRoe, Herbalife, and Plexus have gained a strong foothold in households across the country despite sketchy origin stories and on-going lawsuits. Even worse, many of these MLM schemes have fairly ardent supporters, but just as many individuals reporting the type of MLM horror stories that are highly indicative of scams. MLM’s are far and away one of the most common types of scams, and more often than not prey on stay-at-home mothers desperate to contribute to their household income or find financial freedom. The companies typically promise an easy path to riches but frequently leave individuals burned out and having spent far more than they earned, or just barely making up the cost of purchasing the company’s products. There are even websites dedicated to not just outing MLMs for what they are, but also to provide support for individuals who have been hurt by such scams. Many people get sucked into MLM scams before they realize what they’ve gotten themselves into. By the time it’s too late, many of those who begin working for a direct selling company are out thousands of dollars, as well as friends. This is because MLM companies often push individuals to try to sell to just about anyone they can, including close friends and relatives, many of whom eventually become weary of being viewed as a business opportunity. The best way to avoid MLM scams is to reject any offer to work with a company that wants you to buy and sell their product for them. Additionally, if the company promises you’ll get rich through their method, they’re probably a scam. Helpful websites list MLM scams, so knowing the companies by name can help. This list of MLMs on the Reddit group /r/AntiMLM should be a good starting point. Simply search the list for the name of a company that you suspect might be a pyramid scheme. Importantly, if you’re unsure, simply research the company online first. You’re likely to have different accounts as a freelancer. You most likely have a PayPal account set up for fast transactions, for example, and there’s a strong chance that you are, or will be, part of different freelancing platforms. Any account you have that’s tied to your business is extremely important. So important, in fact, that scammers might try to gain access to them in order to either steal access to your account for their own purposes, to steal money from your accounts, or to hold your accounts hostage in return for a ransom payment. 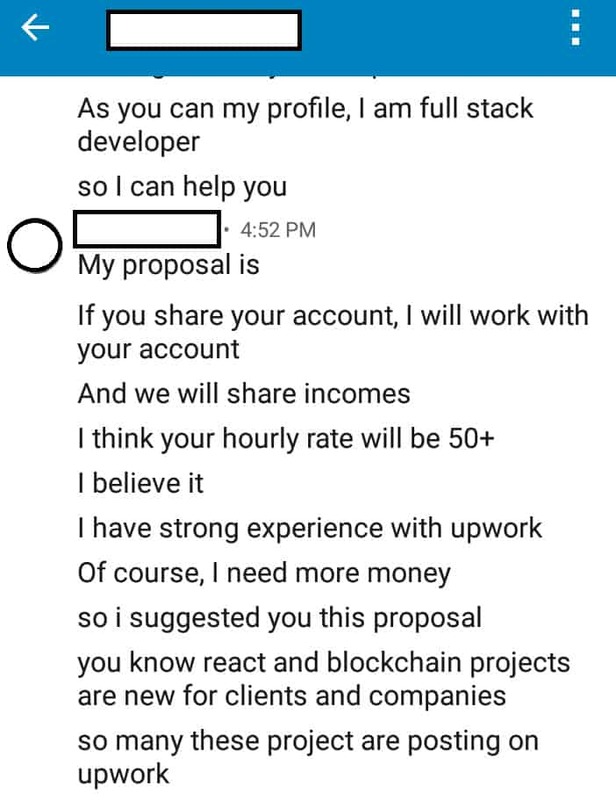 This is a scam attempt I personally ran into not too long ago on LinkedIn. I do a majority of my freelancing work through Upwork, where I maintain a solid rating and great reviews. While a lot of time and effort went into building that good standing on Upwork, it could also be valuable for anyone who manages to gain access to it. This is what one scammer was hoping to do when he contacted me on LinkedIn. 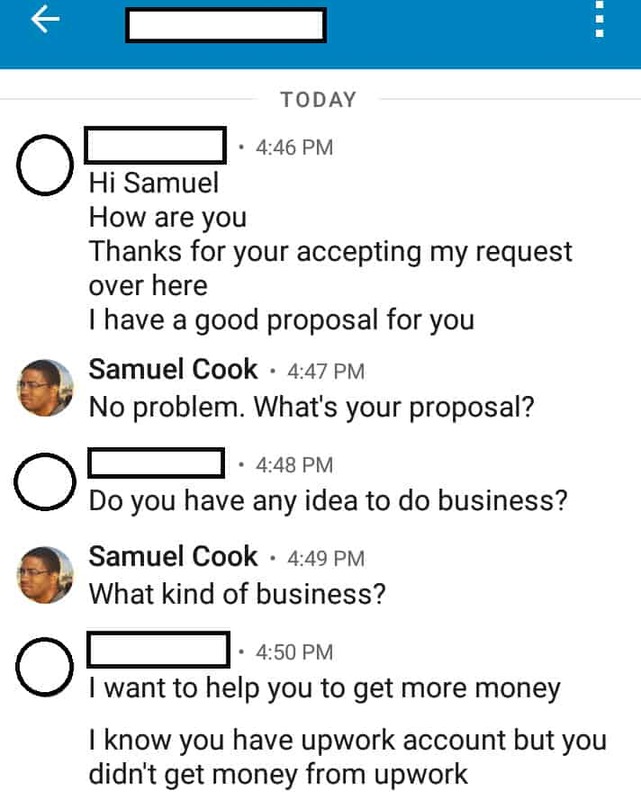 The scammer’s proposal seemed innocent enough at first. He wanted to help me earn more money. And as a freelancer, well, that’s always a proposal I’m willing to entertain. After all, many freelancers with varying skills join forces and help each other out. A writer might team up with a graphic artist, for example. It’s often mutually beneficial. That wasn’t his aim, however, and the red flags went up pretty quickly. He tried to show me his Upwork profile using a dead link, for example, despite his claims that he had a solid profile. If it had existed at some point in the past, it was certainly no longer active. It didn’t take long before he dropped the obvious scam bomb on me. Even if his request was legitimate (it obviously wasn’t) account sharing is against Upwork’s terms of service and is also against the policy for most freelance platforms. Doing so would have not only put me at a scam risk but at a huge risk for losing a key part of my freelancing business. Attempts to get you to share your freelance platform accounts are more common once you become successful and have a good record of solid work. Once that happens, you’ll need to be diligent not to let appeal of extra earnings sway you away from common sense. Anyone asking to share your account is likely looking to steal your account, or worse. That aside, sharing freelance platform or PayPal account information is also a huge privacy risk, as your account likely contains a fair amount of personally identifying information and financial information. If someone asks to share any of your freelancing accounts, just say no. Of all the scam attempts on this list, a tax document scam was the only the only one that nearly took me in before I got wise to it. Thankfully, my suspicious nature took hold and I saw all of the warning signs before giving up my information. Given the nature of the work we do, it’s easy to assume submitting tax forms is just part of doing business. Not so fast. In most cases, you will never need to give a client a W2 or any other form of tax document. Be wary of clients who try to get you to submit tax documents to them. In the US, clients should only require you to submit a W2 if they’re paying you by check, or through direct deposit to your bank account, and they expect to pay you more than the federally mandated minimum for independent contractors that can go unreported on taxes (currently $600). If you’re getting paid through digital payment processing services, clients don’t need to issue a 1099-MISC to you, and therefore don’t need a W2 or your Social Security Number. If your clients plan to pay you through a freelancing platform or electronic payment service, such as PayPal or even by credit card, you won’t need to submit tax documents to them. The freelancing platform or digital payment service will be required to send you a 1099-MISC if you earn more than $20,000 through that platform or receive that amount or more through that payment system, and will likely already have your SSN and other information on file. Clients working through freelancing platforms should not be asking for a W2 or other tax documents. If they do, it’s likely a scam, or the client is grossly misinformed on their tax responsibilities. If the client presses you on it, don’t give in. If you’re working with a client outside of a freelancing platform and you’re not comfortable with giving up your SSN or other information that could be used to steal your identity, request all payments go through PayPal, at least until you’re sure you can trust the client with your information. Finally, if you do get a tax document, know the difference between fake a real tax documents. A real W2 will never come as a Microsoft Word document, for example (which it did when I received this scam attempt). The document should also have the most recently available tax year. If you receive a W2 file, check it against the most recently available document here. As a freelancer, most of your payment options will be digital. However, some clients may pay through check, while others may use direct deposit or credit card. These are all standard forms of payment and typically trustworthy. Some clients will try to scam freelancers by offering to pay via unusual methods. This can include asking freelancers to accept alternative forms of payment (goods and services instead of money) or to accept payment using methods such as gift cards. You should only accept a select few payment methods as a freelancer. These include directly through the freelance platform you’re using, which will receive the payments, extract a fee, or through common payment options such as PayPal, credit card, direct deposit, or by check. There are some other, minor payment systems, such as Square, that you may use if you’re the type of freelancer who sells his or her objects through physical means. However, you should never accept payments through means that are wholly atypical or completely unusual. For example, if a client asks to pay you in goods instead of services, don’t accept it (yes, this happens and I have had a client request this type of unusual payment option before). Clients asking to pay through unusual means are often looking to short change you, or evade tax obligations. To keep your own income reporting safe and to avoid suspicious payment behavior from clients, only accept payment through vetted and acceptable means. In many cases, the client isn’t actually looking to hire. Instead, the client is using test projects to gather quality work from freelancers without having to pay a penny, or by paying a significantly smaller amount than what such a project would usually cost. It’s easy and understandable why many freelancers fall for this scam. Getting a response from a client who asks for a test project is often an indication that they liked your proposal and that you’re close to securing the contract. But there are some clients do will abuse this trust to their own advantage. The best freelance platforms all include an integrated communication system. This system offers some privacy protections for freelancers, making it possible to communicate about business without having to give out personal information, unless you want to or need to for the job. Freelance platform communication systems make it possible to easily file complaints against clients for abuse and fraud. This is why some clients may try to move communication off of the official, integrated channels. If there’s no paper trail to follow on the freelance platform chat system, the freelance platform may not be obligated to assist you in recovering from the negative impacts of fraud. If you’re using a freelance platform, only use the official communication channels until you have developed a strong working relationship with a client. Even then, you may want to stick with the official chat systems that come with these services, as they can help protect both you and the client from potential abuse. For those freelancing outside of official platforms, your best option is to create a separate email address and phone number for business purposes. You can use something like Google Voice to create a VoIP number disconnected from your personal number and have those communications come through to your mobile device so you don’t have to buy two phones with separate numbers. You may also want to create a separate Skype account for business use as well. In all cases, it’s best to not give clients access to your social media accounts, if you can avoid it. The only exception may be LinkedIn, where adding your clients may help increase your business opportunities and give you a chance to investigate the trustworthiness and history of a client. 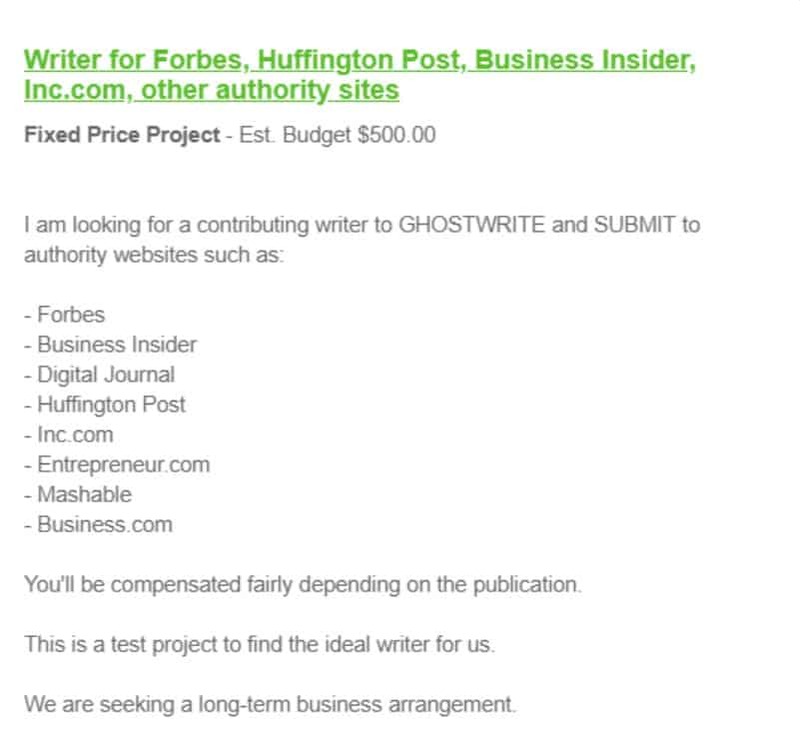 This one is not always a scam but is a considerably unethical ask often targeting freelance writers, in particular. If you have writing and publishing access to some major websites, such as Mashable, Forbes, or Huffington Post, some potential clients may ask you to submit work to those sites in exchange for money. In effect, these clients are asking you to use your privileged access to secretly promote their product or service. At times, however, this type of request can be a scam as well. The freelancer takes on the risk of not only losing their on-going contract and relationship with the websites in question but also may not get paid if the content they write and pitch does not get published. The simplest way to avoid these scams is to never respond to them. If you get invites or requests to use your privileged access or relationship with an authority site to discretely promote a product or service, don’t do it. Have you seen other scams targeting freelancers? Let us know about them in the comments! 1 Why do freelancers fall for scams?